Woodside Energy has won the Australian Petroleum Production & Exploration Association Safety Excellence Award. APPEA Board member and Buru Energy Executive Chairman, Eric Streitberg announced the award at Tuesday night’s APPEA 2017 Conference Dinner in Perth. “Woodside sees its health and safety performance as being essential to its business success and growth,” Mr Streitberg said. In 2016, Woodside had a strong focus on process safety and asset management. 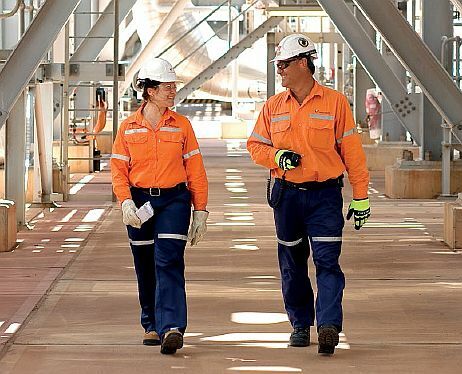 “The company’s Process Safety Management initiative (PSMi) implemented a framework to ensure that all Woodside assets and business functions have a standardised, globally applicable approach to managing process safety,” Mr Streitberg said. “PSMi also eliminated key process safety management vulnerabilities and implemented high-priority improvements that Woodside considered to be necessary for a step-change in performance. The project was a finalist in the Institute of Chemical Engineers Global Process Safety Awards. “One aspect of PMSi was a 45-day integrated turnaround at the North West Shelf Project that was used to execute key scopes of work. This turnaround involved all five LNG trains, the North Rankin Complex and the Goodwyn A Platform. In 2016, Woodside recorded a total recordable injury rate of 1.64. “This is a 60 per cent decrease since 2012 and the lowest TRIR in the company’s history,” Mr Streitberg said. Woodside achieved zero recordable injuries on the North Rankin Complex during the execution of the North West Shelf’s Persephone Project, as well as zero health and safety incidents on Balnaves Decommissioning – the company’s first decommissioning project.